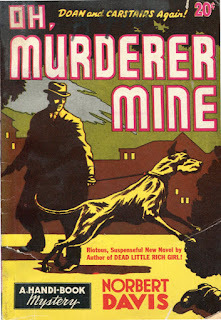 Last year's questions from the audience at my Bouchercon panel on "Beyond Hammett, Chandler, and Spillane: Lesser Known Writers of the Pulp and Paperback Eras" included one about Norbert Davis. I hope the questioner plans to attend Bouchercon 2015 in Raleigh, N.C., next month, because this year's version of the panel will include Kevin Burton Smith, the man behind the invaluable Thrilling Detective Web Site, talking about Davis. The panel, its title slightly inflated to "Beyond Hammett, Chandler, Spillane, and Macdonald," happens Thursday, Oct. 8, 2015, at 2:30 p.m. Sarah Weinman, Jordan Foster, and Laura Lippman will join Kevin, each discussing a favorite crime writer from out of the past. While you rush out to register for Bouchercon, if you have not signed up already, here's a post from the past about Davis, who was known for his comic crime stories, but could get tough when he wanted to. Norbert Davis wrote novels with a dog as co-protagonist. He wrote stories set largely in a restaurant, and he created characters named Bail Bond Dodd and J.P. Jones (the J.P. stands for "Just Plain." That's the man's name — Just Plain Jones.) Yet despite those slapstick touches, and plots, dialogue and action to match, the stories work as hard-boiled tales. Little touches in some of the stories may even reflect the grimness of the Great Depression; Davis published his first stories in the early 1930s. "Jones limped slowly along, his rubbers making an irregular squeak-squish sound on the wet cement of the sidewalk." Is that slapstick (squish-squish), or is it gritty urban realism? In Davis, it's both. When you get to the end of this tale of murder and deception, you'll find the story has come full circle. Read more about Davis at the Thrilling Detective Web site. I have meant to try one of these since a recommendation on forgotten books. Thanks for the reminder. Maybe sometime this winter, you would write another one for me? Has someone (me, perhaps?) done a forgotten books recommendation on Frank McAuliffe? I've read quite a few of Davis's short stories as well as two of his novels, "Mouse in the Mountain" and "Sally's in the Alley." 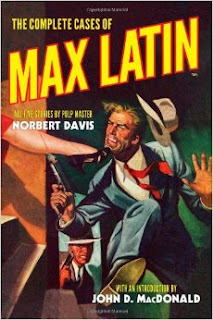 Of the ss's I guess I'd say the Max Latin series is the best of a fair bunch. Maybe add "The Price of a Dime" and "Red Goose" to the list (both appeared in Black Mask in the 1930s). However, I find his blend of slapstick and hard-boiled fiction an awkward combination, neither fish nor fowl, and really can't recommend him to people wanting to read the second-tier Black Mask writers. A number of 1940s writers tried to imitate Raymond Chandler's humor and most, like Norbert, tended to go overboard when they did. I like "The Price of a Dime," and I'd likely agree with you on the Max Latin stories. I also liked the Bail Bond Dodd story I read in, if recall correctly, The Big Book of Pulps. Davis' blend of slapstick and hard-boiled works best when he achieves a kind of comic world-weariness. The purely comic bits do sometimes lead an uneasy coexistence with the action. I'm not the hugest Doan & Carstairs fan, but the wackiness does set off some of the surprisingly harsh violence nicely.